Usually it’s kids asking Grownups for treats, but today this kid is giving us an art treat! 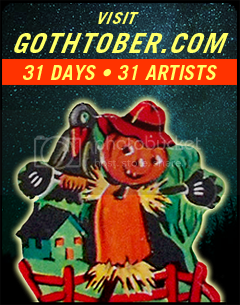 Go to www.gothtober.com and click on day 2 for a nice surprise. The Web of Wonders! An orange and black web of varied creatures provide a succulent meal for eight-legged arachnids! Dimensional presentation of hissing creatures! Look out, they might bite! The Annual Night Time Food Festival, where they’ve got a very gory farm special for sale! Supernatural savings! A 13th birthday party for Gothtober, complete with mini ghosts, pumpkins, banners and plenty of other happy guests! The Thomas Family worked together to make these tableaus for us to enjoy, they are indeed a family of many talents. This family loves to make stuff, and Heather Thomas, the Mom of the operation, has a food blog with recipes on it like dairy free Mac-n-Cheese, Ginger Snaps, and Mexican Chocolate Brownie cookies!!! Her husband, Russ, is a chef extraordinaire, if you are ever up in San Luis Obispo and they offer to cook you anything… just say yes. WE ARE LIVE!!!! 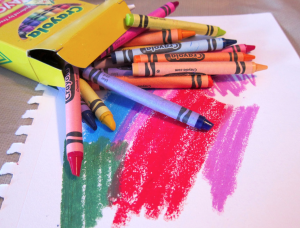 DAY 4: Gothtober Coloring Contest!! !